5 inch by 5 inch bag for hold dice, coins, whatever you want! 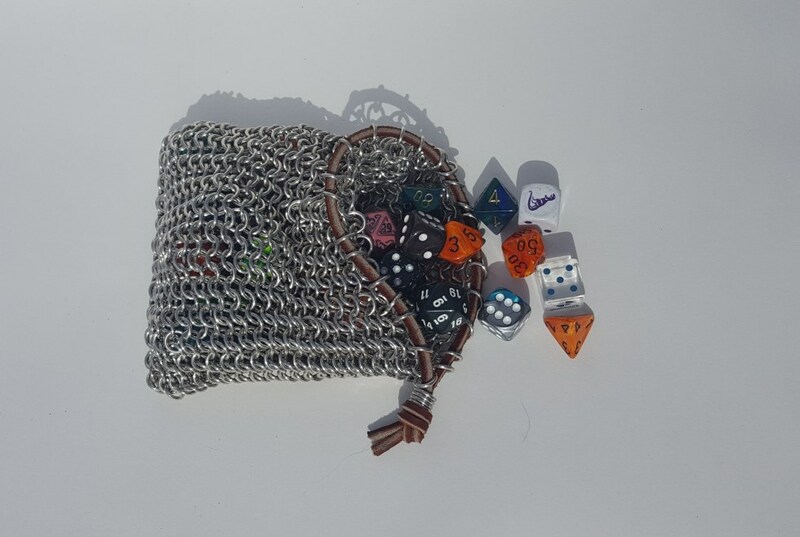 This is a handwoven dice bag made using aluminum rings in the european 4-in-1 style. Features a real leather drawstring. Obviously I display this as a dice bag but you could use it for coins, makeup, random trinkets, whatever you want! dice bags are one of my favorite things to make and I know you'll love it! I am also happy to take custom orders! email me at ApiseraCraftworks@gmail.com if you have any questions, suggestions, concerns, or custom requests I'd love to hear from you! This item ships from United States. An additional charge of $5.00 will be added to each order for the current item.